Pono, a self-described hapa haole, part white and part Hawaiian, has done time in not only Afghanistan, but also the Inside as he refers to prison. Attempting to now live the life of a writer and teacher of surfing, he becomes embroiled in a homicide investigation. A likeable character with definitive views regarding politics, “The wrong politicians commit is pretending that they’re not. And while a whore actually gives you something for your money, a politicial just takes your money and screws you in a different way” (10), the reader ends up rooting for his escape from one predicament after another. From an English teacher’s perspective, though, I had no choice but to highlight grammatical errors such as “1930’s” (73) and “‘farms’.” (47). No apostrophe needed in the first example, and the period should be inside the quotations for the second example. In addition, the protagonist’s switch from a Hawaiian dialect in dialogue to standard English in thought caused confusion when considering these differing sentence structures were originating from the same man. Yet, perhaps this was intentional on Bond’s part considering Pono was of mixed heritage. 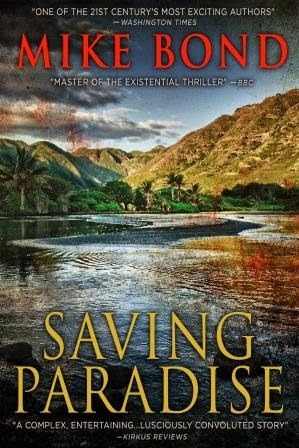 If a meeting on the beach in Hawaii is not in the cards for your book club, Tangueray martinis in honor of Pono and half-pound burgers similar to those served at Wipe Out, a downtown bar which Pono frequents, would serve as an adequate substitute.